If a guy dressed up like a clown walks into your office and produces for you a balloon poodle, you’re not going to be that surprised. If your boss comes into your office and starts krumping, you’ll probably feel differently. The Charger Hellcat is the clown and your krumping boss is the Cadillac CTS-V. It’s insane, in a less obvious way. As a site, Jalopnik joined every other car news source in engaging in the Hellcat hype because it was worth engaging in at the time. Clearly, the novelty has worn off, at least a little bit, for the parts of the automotive press who aren’t being paid to care. Fiat Chrysler, which is still juggling a few older borrowed platforms, has managed to make their aging LX products interesting by offering a lot of trim levels and engine options (the Dodge Charger, for instance, is available in more permutations than Waffle House hashbrowns.) This has also proven to be an extremely profitable strategy for them. For the Charger and Challenger, the Hellcat stands at the top with a truly ridiculous 707 horsepower out of a big supercharged V8. The sedan is the fastest sedan (by top speed) because it’ll get to 204 mph before physics gives out, although I’m guessing your nerve would go first. Mine certainly would. In that context, the new CTS-V, with its comparatively reasonable 640 horsepower and 201.4 MPH top speed is the tamer car. It’s slightly slower and has less horsepower. This is the wrong way to think about it. Despite sharing some of its DNA with an older Mercedes E-Class, the LX platform on which the Challenger, Charger and 300 are built is primarily a Chrysler product and is old-fashioned compared to what you’d find under a modern Mercedes. Does that matter when you’re driving it? Not really. A Chrysler 300S is a perfectly fine car. It does limit what you can do with the car, however. It’s the reason why there’s no true track-ready GT350R or Z/28 variation of the Dodge Challenger, and instead there’s the OH-MY-GOD-WHY-CHALLENGER-HELLCAT. I’m sure someone at FCA is smart enough to make a Challenger handle like an Alfa, but they already sell Alfas and it would cost like a billion dollars so what’s the point? I’m not sure what Cadillac spent to make the CTS-V what it is, but it’s certainly money well spent. We’re getting to the point where it’s no longer a thinly veiled insult to say “This is the best car Cadillac has ever built.” The Cimarron is dead and gone and the vast majority of people in this world don’t know what it was or what it stood for. The last CTS-V was great. The new ATS-V is the true successor to the last CTS-V and is, not surprisingly, even better. But the new CTS-V is so good it makes the old CTS-V feel like a kit car by comparison. 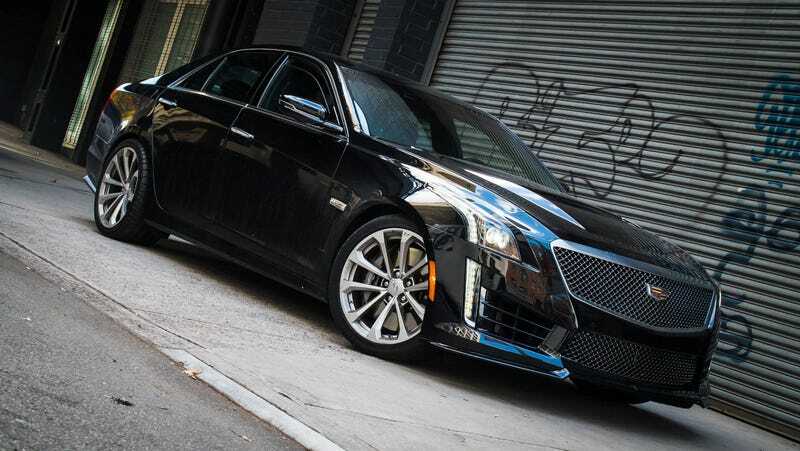 The current Cadillac CTS-V is something else. It’s bigger than an old CTS and now squarely in the 5-Series/E-Class dimension. I enjoyed the last CTS-V and felt that it was refined enough for what it was. The concept of the CTS-V is not that dissimilar from the Hellcat, so you sort of took the slight edge of the older car as downright remarkable given that it had a damn Corvette engine underneath the hood. There’s still a supercharged variant of a Corvette engine underhood, but now it’s less obvious. Take the mesh grille, Gillette hood vents, and Recaros away and never press too hard on the skinny pedal and as a driver you’d assume it was just another luxury car. When you consider what a CTS-V can do in a straight line or a curved line or any kind of line you’re looking at performance that would have made a competitive race car not that long ago, but now it has a navigation system and heated seats and you don’t have to be Warren Buffett to afford it. The Hellcat, at least, is hard to miss. Whether you’re in it or outside of it you get the impression of Slim Pickens riding an atom bomb to global destruction. The CTS-V on the other hand, is one of those quietly pastoral Nebraska plains hiding a modern ICBM underneath. With features like a vertical oil reservoir that keeps that big V8 lubricated during hard cornering and giant custom 15.6-inch Brembos this is a car you’d actually want to take to the track, as opposed to the E63 AMG or modern M5, which are more Autobahn cruisers (although credit to Mercedes for keeping the wagon). They’re also more expensive. I had it for a weekend and I didn’t, unfortunately, get to track it. What I did get to do was drive it like a normal person. I got stuck in traffic. I merged onto freeways using New York’s hilariously short onramps. I traversed narrow backroads covered with deer. Under normal circumstances it’s a car. It’s comfortable. It has Cadillac’s still annoying CUE infotainment system, though that’s been improved now to the point where it’s faster and unquestionably better than ever before. My passenger, who also did some time with me in a Hellcat Challenger, never felt like I was about to enter the 24 Hours of Le Mans. In fact, the only clear sign that you’re in something so crazy is when you look at the range the car typically has, which is somewhere around 230 to 250 miles if you drive it with any vigor. When Jerry Siegel and Joe Shuster penned Superman they created the convention of the superhero who dresses like a normal person and then reveals themselves as something more. But Superman was a journalist, which is still kind of exciting. Imagine if they’d have made Superman the chief auditor at T. H. Daily Actuary Services. That’s the CTS-V. In driving a Bugatti Veyron, Hellcat, CTS-V, and a ton of other performance cars the last couple of years what’s struck me is not that cars have gotten so fast, it’s that fast cars can be driven so slowly.